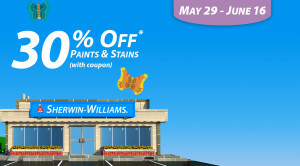 You can save 30% on Sherwin Williams paints and stains, and 15% on painting supplies from now through June 16, 2014. Unlike their last sale, this one requires that you present a coupon, which you can find here. While this isn’t their very best deal on paint – they offer 40% off a couple times during the year – it’s still quite a savings. So, tell us…what are you painting and what color did you choose?